February 16, 2015 – As Canadians in several provinces mark the last day of a long weekend, new research from the Angus Reid Institute shows just one-in-ten say they never work overtime, while one-quarter say they do so regularly. The online survey of 894 working Canadian adults canvassed how much overtime we work, why we do it, and who gets paid for it. This follows a study released last week about Canadians’ use of technology at work and the extent to which checking in after-hours is the “new normal”. Certain segments of the workforce stand out for their workaholic tendencies, though the survey shows a full majority of those in most occupational “collars” work overtime regularly or occasionally. Two exceptions where the practice is somewhat less common are clerical and administrative workers and those in sales, service and hospitality jobs. Meanwhile, those who are managers or executives are twice as likely to report working overtime “regularly” than working Canadians overall (43% versus 23%). Canadians employed in the private sector are more likely to report working overtime regularly or occasionally than those in the public sector, although not by a huge margin (64% versus 53%). But do we really have to work overtime? 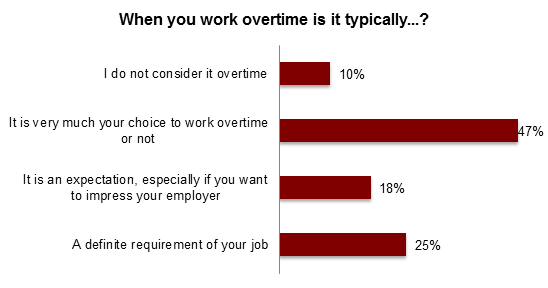 Interestingly, even as a large majority of Canadians report working overtime, nearly half also say working overtime is “very much their choice” (47%). One-quarter (25%), on the other hand, said it comes with the territory, that working overtime is a “definite requirement”. And then there are the keeners: nearly one-in-five (18%) say the concept of working outside office hours is more of an expectation, and helpful when it comes to impressing one’s employer. Notwithstanding their motivations or sense of obligation around overtime work, significant differences exist when it comes to whether Canadians are being compensated for their additional efforts, particularly depending on whether or not they are union members. 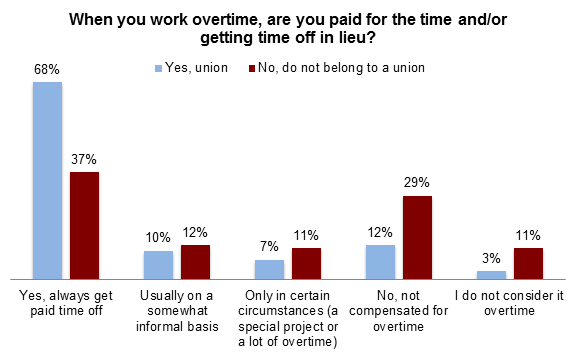 Among all employees who reported some overtime work to the Angus Reid Institute, just under half (45%) say they are always compensated, either in pay or time off in lieu. One-quarter (24%) say they are never compensated. There were eight per cent who say they don’t consider their after-hours work to be overtime. Union members say they are “always” compensated for extra work almost two-to-one over non-union members (68% versus 37%). Conversely, nearly three times as many non-union members say they are “never” compensated for overtime as union members (29% versus 12%). There are other variations in compensation incidence by industry and public-private sector consistent with differing levels of unionization in these respective workforces.